Four environmental groups have won a temporary injunction to stop exploratory work by TransCanada to develop an oil port in Cacouna, near Rivière-du-Loup, ​on the St. Lawrence River. Environmental groups say project threatens beluga whales near Cacouna, Que. Four environmental groups have won a temporary injunction to stop exploratory work by TransCanada to develop a port in Cacouna, near Rivière-du-Loup, ​on the Saint Lawrence River. The groups argued the TransCanada pipeline project threatens a nursing ground for beluga whales. "The judge agreed with us, and I think that is a clear testament to the fact that the Quebec government needs to go back and do its homework; needs to seriously consider the science that's widely available on this endangered species," said Patrick Nadeau, spokesman for the Canadian Parks and Wilderness Society, one of the groups that sought the injunction. 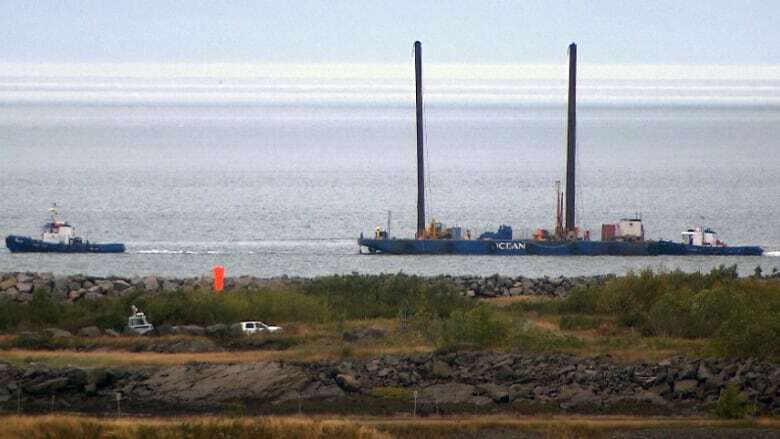 Work had started near Cacouna earlier this month, but lawyers representing the David Suzuki Foundation, Nature Quebec, the Canadian Parks and Wilderness Society and the Quebec Centre for Environmental Law filed an injunction to stop the drilling. The company wants to build a petroleum port at Cacouna and is in the process of checking soil composition to see where to place a terminal that would take in crude being transported via the pipeline to refineries in Eastern Canada. ​On Tuesday, a Quebec Superior Court judge suspended the certificate of approval issued by the province and ordered all work to stop immediately. The judge found that Quebec's environment minister, David Heurtel​, made an error in granting the permit, saying he did not have enough information to do so. "That's essentially what the judge decided today: that the minister issued a permit but didn't have the proper information to do so," Nadeau said. A spokesperson for the environment minister said Heurtel won't comment because the matter is before the courts. The court ordered the Alberta-based company to cease work until Oct. 15. The environmental groups had requested that date because the belugas are considered to be most at risk during that period. Nadeau said the groups will continue their fight to halt the project permanently. The TransCanada Energy East pipeline project includes converting an existing natural gas pipeline to an oil transportation pipeline. This project is controversial and Quebec's environmental assessment board is still reviewing it. Barges have already arrived in Cacouna with crews ready to study the seabed for the port project.